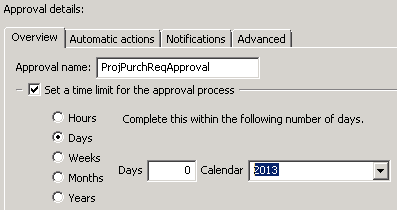 “Target date not found in work calendar” was an error that was reported to me by a customer using workflow in AX2009. It was easy to find that it was thrown by WorkflowWorkCalendarDueDateProvider.isWorkingDay() but it was far from obvious why. This seemed to be the core problem – the calendar contained dates for a single year only and anything outside that year caused an error (because, as the error message correctly said, the target date was not found in work calendar). A calendar used in workflow should cover all possible dates (we can add additional dates to the calendar when needed, but we won’t have to ever change the reference to calendar). If it needs to be changed, the workflow configuration should be dropped and set up again. How do I do the same thing in Ax 2012 ? Don’t try to use this piece of code in AX 2012. The whole Duration field has been deprecated there.